Every year in November, I do two weird things. First, I get out this wicker cornucopia I’ve had since Rhonda and I got together. She always laughs about it because it is kind of funny that we actually have a wicker cornucopia. I have no idea where it came from – probably some Michael’s or Pier One clearance shelf from the very early days of our relationship. I love it though and every year around the first of November, I dig it out and fill it with a colorful collection of gourds and pumpkins. It reminds me of the abundance in my life and to stop and be thankful. Heading into this Thanksgiving week, my cornucopia runneth over. This past year has held a lot of changes and challenges that have been both thrilling and scary. I won’t go on about all of that again – you’ve read the stories and know all about the chaos of the past couple of months. We’ve had a dream come true, and for that, I’m thankful. The second weird thing I do in November is bake pumpkins over an open fire to make my own pumpkin puree for our Thanksgiving pies. I’m not even sure why I decided to do this other than I wanted to feel more connected to something ancient – like the native Americans who have inhabited this land for so much longer than we have and also to honor something more recent like my pioneering ancestors. I’m not really sure I personally have any pioneering ancestors but living in the Southwest for 17 years has made me more aware of the harshness of the environment that early American settlers faced. Thanksgiving is the one big holiday Rhonda and I usually host. It’s probably my favorite holiday after Halloween, which is my absolute FAVORITE. 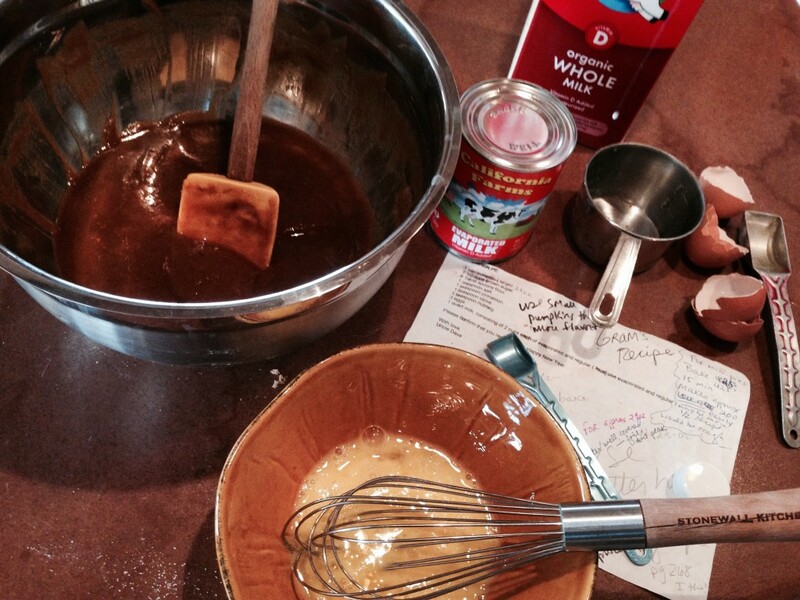 I love the days leading up to Thanksgiving – the baking and early preparations. And the actual whole easy day itself – the grand finale of cooking, the cocktailing, footballing, and laughing with everyone in the kitchen. There is no obligation to do anything, but show up with your assigned dish(es). This year, we are hosting our first ever Dusty Dog Thanksgiving. No family members are making the trip, but we are having 7 friends for an evening feast. We’ve ordered a humanely raised, Amish smoked turkey for the carnivores and a salmon florentine en croute for me and any other pescatarians. Rhonda’s making sweet potatoes, cranberries, and corn pudding. I’m making dressing, green bean casserole, and yes, the pumpkin pies. Friends are bringing the rest – mashed potatoes, pecan pie, and what Thanksgiving would be complete without a jello mold. 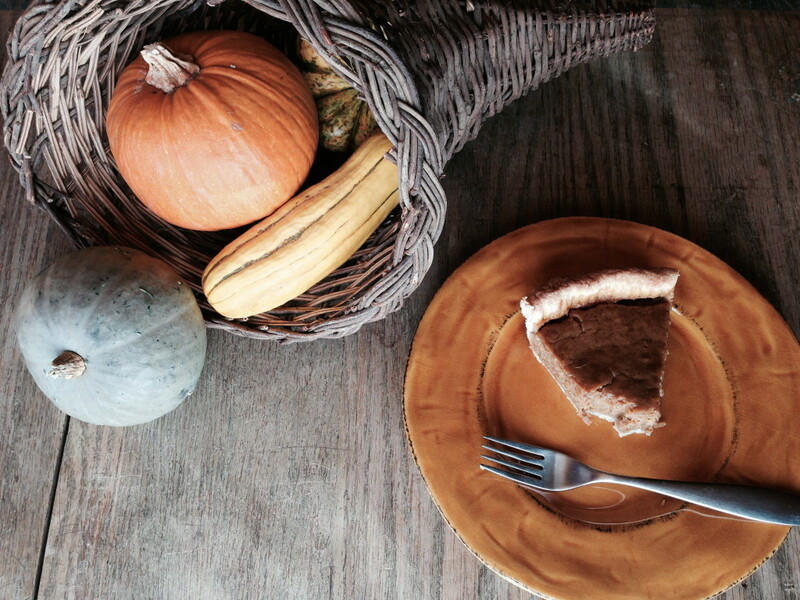 After I bake the pumpkins over the fire, I use my Gram, Josephine Ramish’s, pumpkin pie recipe to make our pies. Don’t worry, you don’t have to do some freaky Thanksgiving ritual over a fire to make her pumpkin pie. Good old fashioned canned pumpkin will work – that’s what she always used. Gram’s pie is a rich, custard-like, slightly spicey, very sweet, melt in your mouth concoction that I promise you will make again and again. I hope this Thanksgiving finds all of you with a cornucopia overflowing with goodness, close friends and family around whatever table you find yourself, and your own quirky traditions. 1 single pie crust (pate’ brisee) scroll through the dialogue on the crab & cheese turnover page until you get to the directions for pate’ brisee. Cut the recipe in half to make a single pie crust. 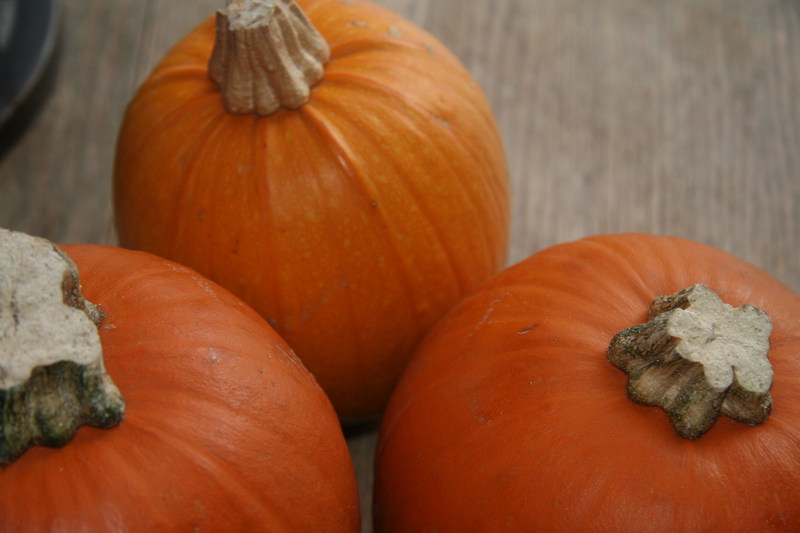 If you wish to bake your own pumpkins – choose two medium baking pumpkins or even three small baking pumpkins. I think the smaller the more flavorful. I usually make three pumpkins so I have a little pumpkin left over for other things like muffins or pancakes. 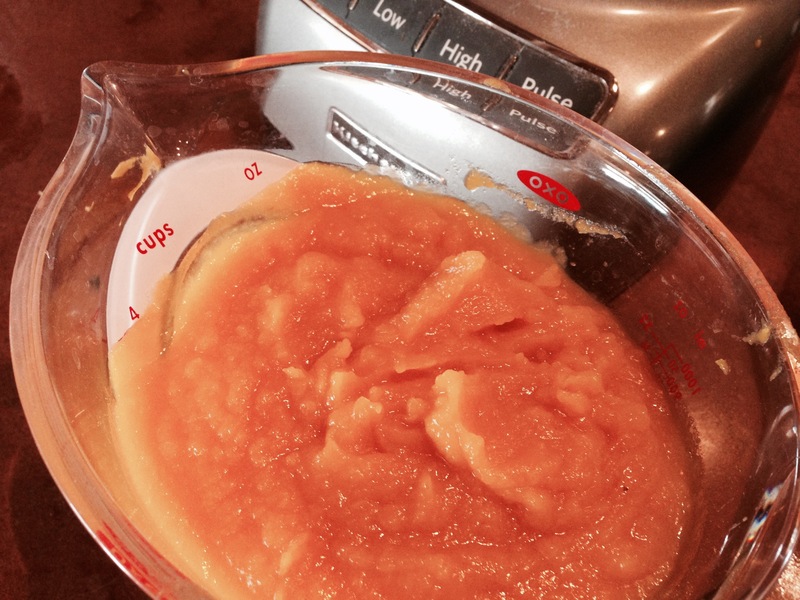 You can freeze the left over puree or keep it in the refrigerator for 3 – 5 days. Today, I made three medium sized pumpkins, which yielded four cups of cooked pumpkin puree. Cut the stem off the pumpkins then slice them in half. Use a spoon scoop out the seeds and stringy insides. I find using a grapefruit spoon with a serrated end works really well. 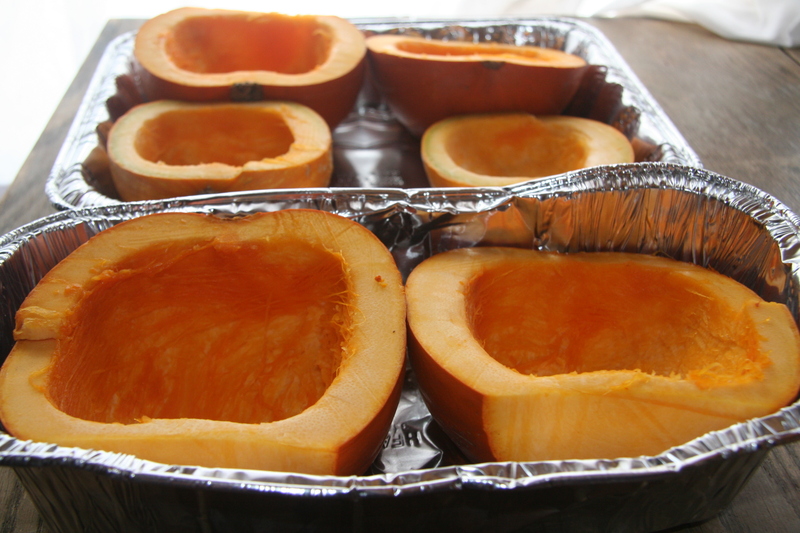 Place the halved and cleaned pumpkins face up into a foil pan with 3 cups of water on the bottom. 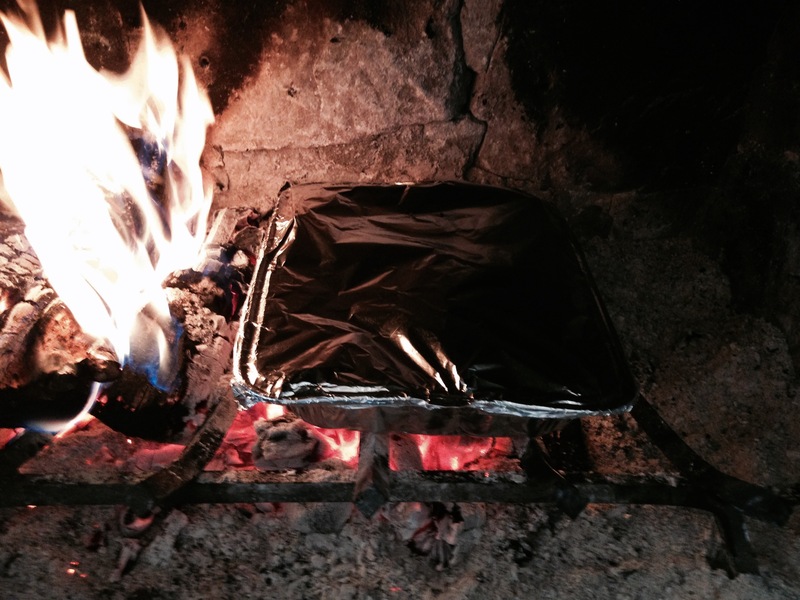 Cover the pan with foil and place on top of hot coals in a fire. Normally, I do this in my outdoor fire pit, but this year, my fire pit is filled with snow. Instead, I made a fire in our fireplace early this morning allowing a lot of hot coals to build up. When my pumpkins were ready for the fire, I moved the big logs to the side and slid all the hot coals under the grate. I placed the covered foil pan on top of the grate and let the pumpkins cook for 45 minutes without peeking. You will hear the water on the bottom of the pan steaming and sizzling – that’s ok, that means it’s working. 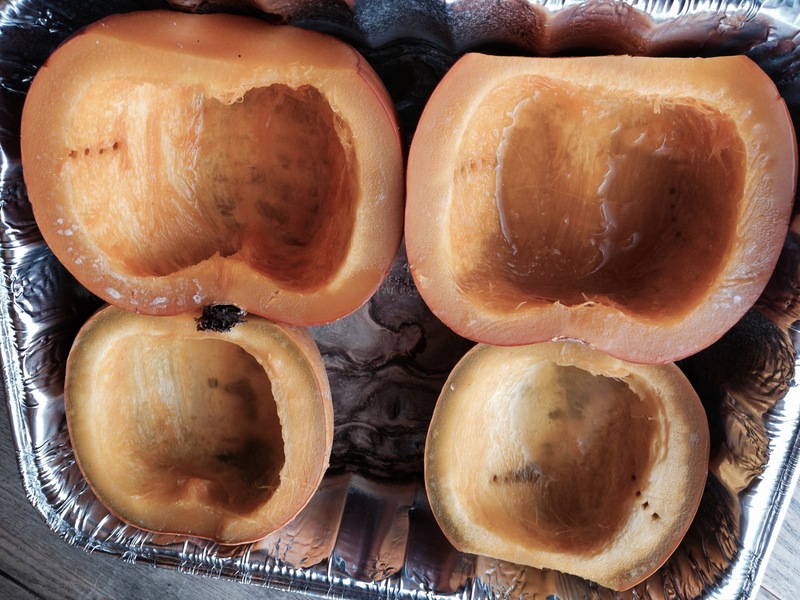 If you don’t have a fireplace, or you just don’t want to mess around with such antiquities, then place your pumpkins face up into an ovenproof baking dish, fill the bottom of the pan with 3 cups of water, cover with foil, and bake at 375° for 45 minutes. After 45 minutes, remove the pumpkins from the fire or the oven and test for doneness. 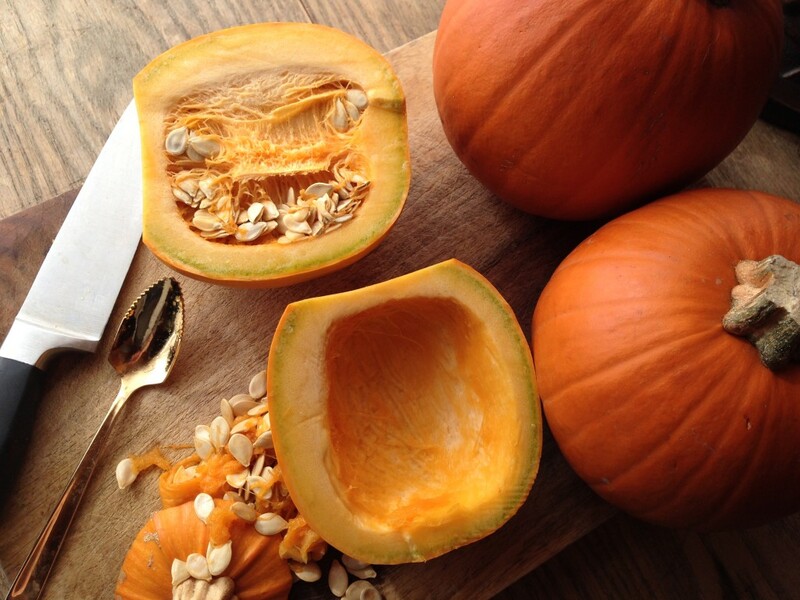 Using a fork poke the inside pulp of the pumpkin – if the pulp feels soft and your fork slides into the flesh without resistance then they are done. You may need to bake the pumpkins for another 15 to 30 minutes until the flesh is soft and easily comes off the shell of the pumpkin. After the pumpkins are done baking, let them cool. 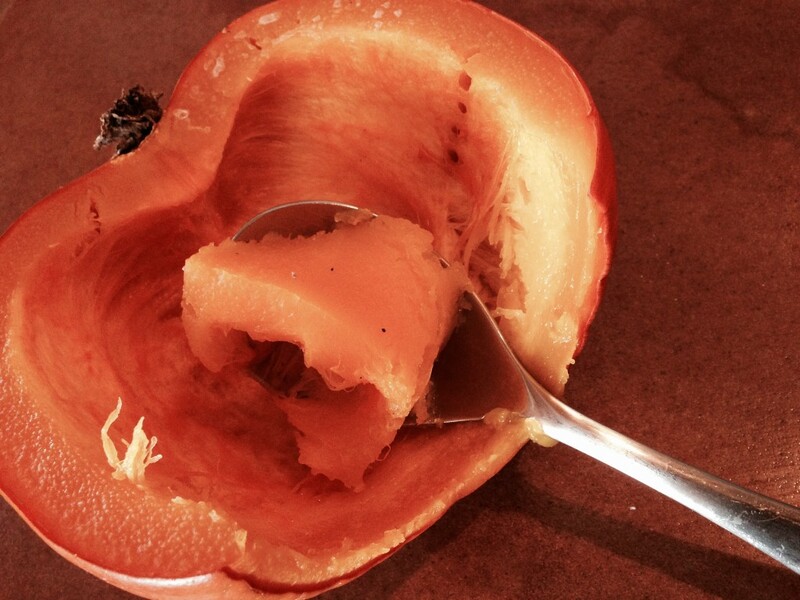 Once cool, use a spoon to scoop out the cooked pumpkin. The pumpkin will easily come away from the shell. 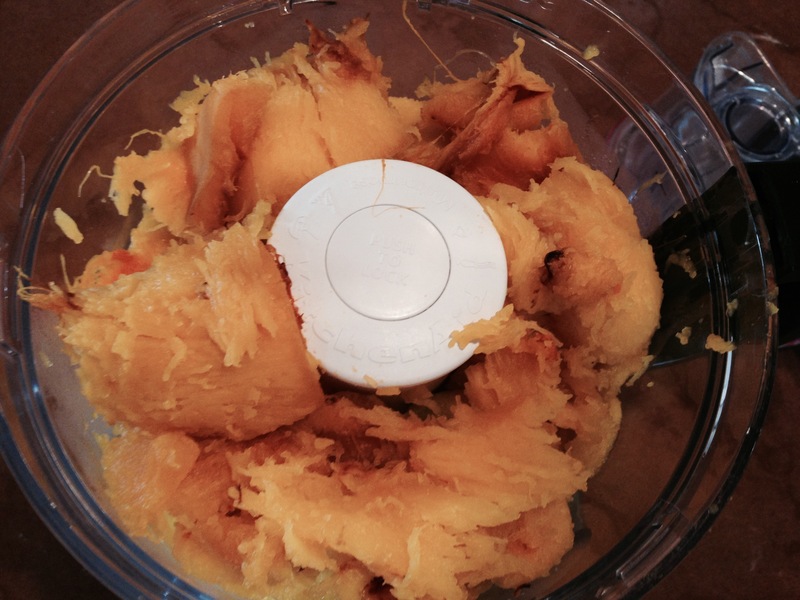 Place the cooked pumpkin in a food processor and process until smooth. If you don’t have a food processor use a handheld or standing mixer, and if you don’t have either of those then use a potato masher. Preheat the oven to 425°. Mix the ingredients for pate’ brisee or use your favorite pie crust recipe. 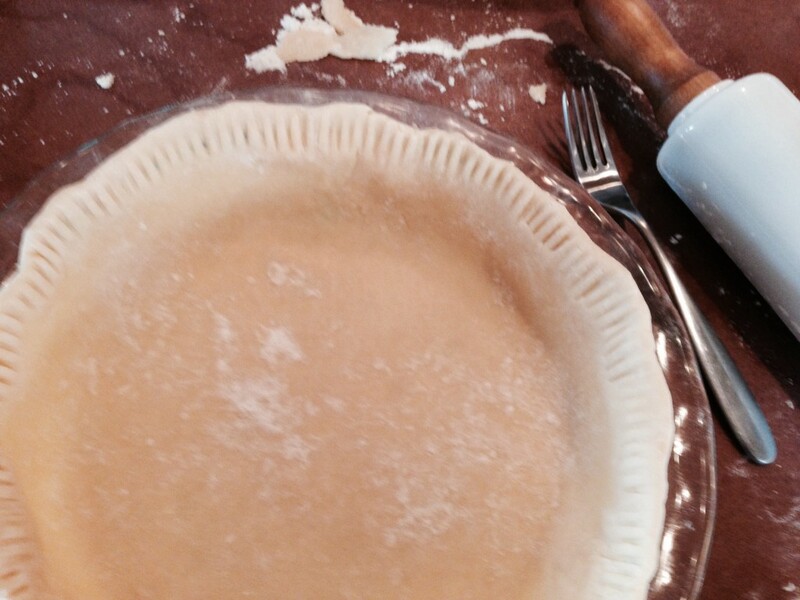 Roll out your pie crust to approximately 1/8th inch thickness then place the crust in a deep pie dish. Add all dry ingredients to the pumpkin puree and mix thoroughly by hand. If you don’t mix the dry ingredients first you could end up with lumps in your finished pumpkin filling. I speak from experience here. Once your dry ingredients are mixed completely, add the eggs, evaporated milk, and whole milk and incorporate all ingredients – again by hand. 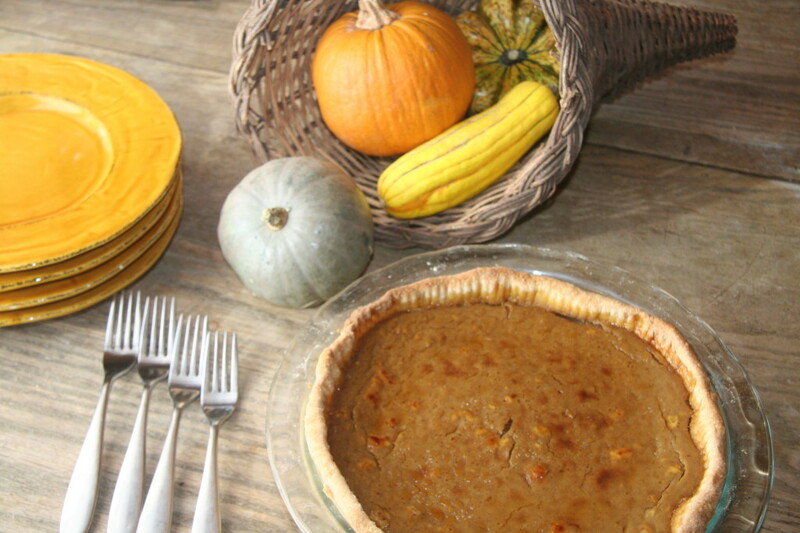 Once all ingredients are completely mixed together pour the pumpkin mixture into the prepared pie crust. 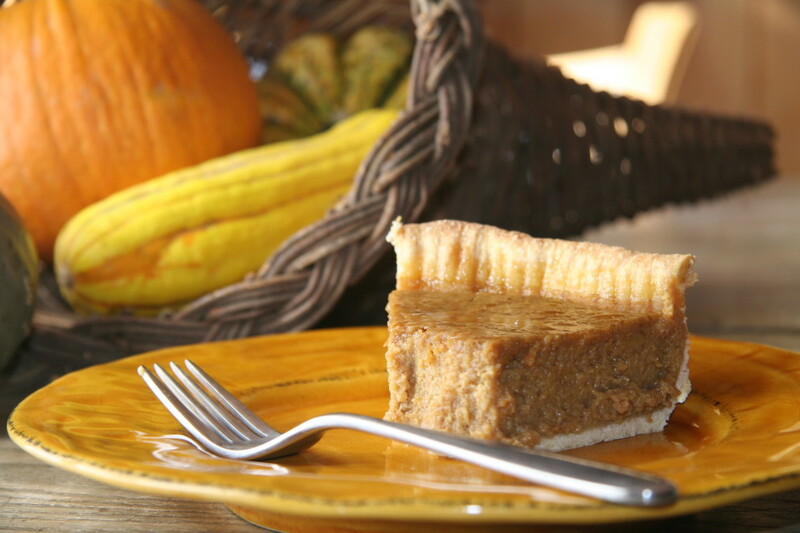 The pumpkin filling should not go to the top of the crust – allow about 1/2 inch of space at the top of your crust. The filling will plump up while baking. 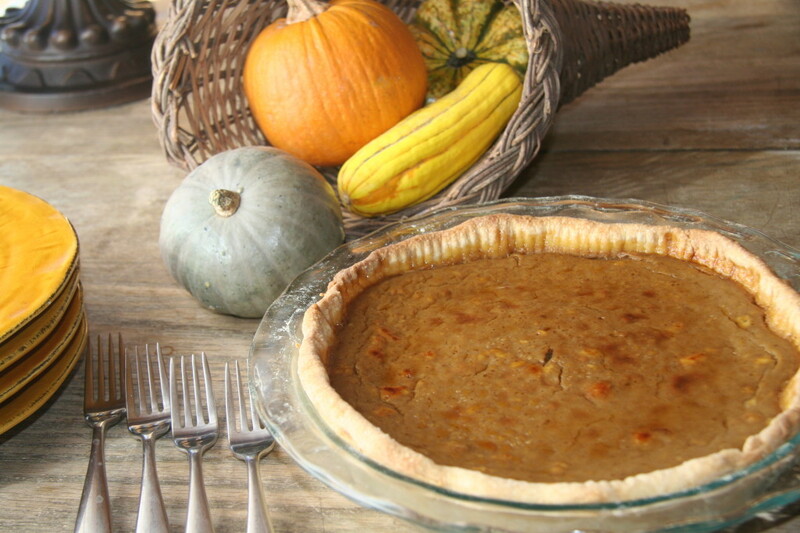 Cover the edges of the crust with a pie crust protector if you have one – if not, do your best to cover the edges of the crust with aluminum foil, then go out and buy yourself one of these great pie crust protectors. You won’t be sorry – I promise. The filling will be very liquid so don’t be alarmed – it will thicken during baking. Bake at 425° for 25 minutes then remove the pie crust protector, reduce the heat to 350° and bake for an additional 25 to 35 minutes. The pie is done when a knife inserted in the middle comes out clean. 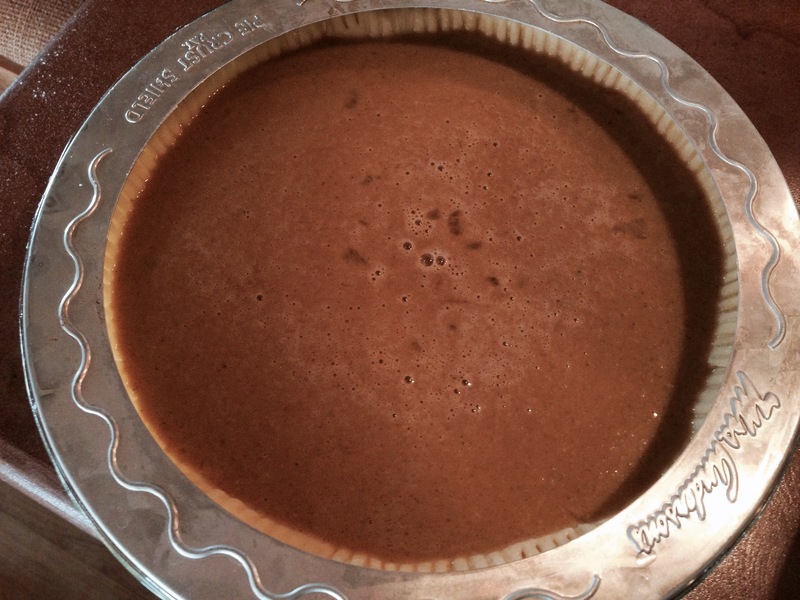 Allow the pie to cool and settle for at least an hour before slicing and serving. Serve alone or with a dollop of whipped cream. This entry was posted in Celebrating, Dessert, Recipes, Sweet Pies, Uncategorized and tagged Baking Pumpkins, Dessert, Entertaining, Holidays, Pie, Pumpkin, Pumpkin Pie, Savory Pies, Thanksgiving. Bookmark the permalink. Your pie looks so good. You are very clever cooking the pumpkin in the fireplace and then pureeing it. I would never have thought of it. I wish I could sneak a piece of the pie . I have enjoyed you pumpkin pie at a previous time and it is absolutely fabulous. 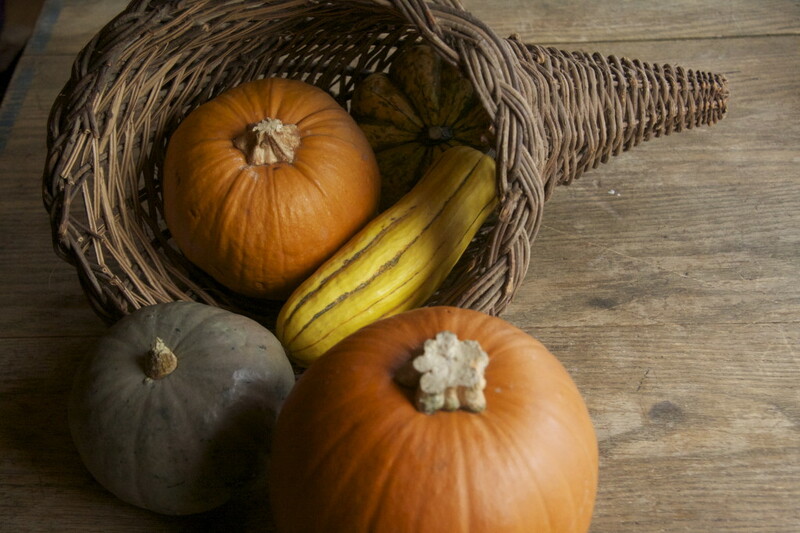 We know your Thanksgiving table will be delicious and beautiful. Enjoy! We will be thinking of you, Rhonda,and the gang. We are going to miss you and Howard this Thanksgiving!